The whole premise of gargoyles being protectors intrigued me. Add to that the rich Parisian setting. I also love historical paranormals. When I read a blurb for THE BEAUTIFUL AND THE CURSED in the June/July issue of JUSTINE magazine, I knew I had to read it. What worked for me: I loved the premise of cursed individuals being forced to be servants of angels. This eternal sentence is given to humans who kill a holy priest in their life time. They are given the charge to protect humans in holy places. The turmoil and pain of the gargoyle Luc resonated throughout this novel. His attraction to Ingrid and how he fights against it while his heart tells him otherwise kept my interest. This is kind of like a paranormal Romeo and Juliet story. You can't help but think it might end up bittersweet. Ingrid's struggles and the horror she finds with a personal revelation had me turning the pages, wanting to find out more. Of all the characters in this story, Ingrid had to be the strongest and most multi-layered. She's flawed and vulerable with her personal insights into how she feels no suiter will want her after a scandalous affair in London. She knows it's not 'right' to love someone who might in fact not be human but she's willing to take a chance. Even if, we know, it won't work. Loved that about her. I also love the Parisian setting at the end of the 19th century. What didn't work: There are many different points of view throughout this story. I admit I thought this made this story confusing at times. Ingrid's sister Gabby's story felt almost one dimensional. I get that she was supposed to be strong and opinionated but how she throws herself into danger just didn't work for me. Her attraction to Nolan, one of the Alliance, almost was too rushed and forced. Likewise the brother Grayson torture almost interrupted Ingrid's story. I personally felt this was Ingrid's story. I would have loved to see everything through her eyes, including the revelations about her family and the Dispossessed. Those parts of the book were the strongest. I wanted more. Still I do think fans of historical paranormals might enjoy this story. Ingrid's struggles between her true nature and her attraction to Luc are what drive this story. I've never read anything like it! I received The Beautiful and the Cursed by Page Morgan from RandomBuzzers and this is my honest review. The Beautiful and the Cursed is about two young ladies Ingrid and Gabby Waverly whom are forced to move to Paris with their mother for a few reasons. When they arrive they find that their new home is not what they expected it to be. These two girls also have no idea what kind of things there eyes are soon going to be opened to. I was crazy hesitant to pick up this book because even though it had a beautiful cover, I had never read a book that was it was set in 1899. The reason this threw me off a bit was because I was afraid that the language would be strange and I wouldn't be able to get into it because of that but I'm very glad I gave this book a shot. I had a very hard time putting it down from the moment I picked it up. The plot? The press release that came with the book seriously didn't lie. I've never read a story like this and I loved every second of it. I enjoyed that Ingrid had powers, because in the beginning she was just a quiet soft spoken girl who was worried about her brother and heart broken from her life back home. Which was cool but then she started discovering her powers which made the book 20 times more interesting. Now I need to rant about the few things that annoyed me. The first is the book was paced so well until the very end. The last like 4 or 5 chapters felt really rushed for me. I felt really overwhelmed when it came to the end. Everything just seemed to be happening all at once and I couldn't keep up. I kept having to put the book down to process what happened and then pick it back up once my mind was clear. The only other thing that crushed me was the last words between Luc and Ingrid, I won't spoil it but SERIOUSLY?! Overall, I'm really glad there is another book in the making I need to know what happens next! I picked up this book at my local library almost as soon as it became available (I jumped the gun on requesting it and beat everyone else to the punch). I was excited about delving into my first historical fiction book. I am not normally into those sort of reads. I think it's because I tend to find the future more intriguing than the past. I am more awestruck by zombie apocalypses or restructured societies than the time when women lived an oppressed life or countries warred at the drop of the hat. Strangely, I found myself requesting this book regardless of the fact that it took place in Paris, 1899. The story opens with two prim and proper Londoners moving to Paris with their mother to pursue her dream of opening an art gallery. Gabby, the outgoing and spunky younger sister, and Ingrid, the quiet and studious sister, have come to live in an abandoned abbey that Ingrid's twin brother, Grayson, had chosen for them. When they first lay eyes on the place, they are aghast to see hideous gargoyles marring the rooftops of the abbey as horrific sentries. Little do they know that the horrific decor is the least of their problems and may be the soul reason they were forced into living in the abbey. Soon enough Gabby and Ingrid come to the realization that their brother, Grayson, is missing. While most would rather sweep it under the rug, the sisters refuse to give up on their brother. Ingrid in particular knows that Grayson is somewhere hurt and scared. She has a special connection with her womb mate and is more determined then anyone to see him home safely once more. In Gabby and Ingrid's search for their missing brother, they come face-to-face with things only found in books. Stone gargoyles who are set to protect those who inhabit their territory with their lives, demons who reek havoc and misery upon the sisters and the Parisians living around them, and a secret society of humans bent on protecting the humans outside of the gargoyle's duties. On top of everything, Ingrid has started developing mystical powers that she knows nothing about and insights fear and discord among the human society and gargoyles alike. 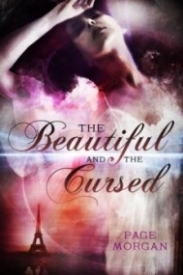 The Beautiful and the Cursed was a twisted tale of good and evil where even those suspected of having no soul at all, can turn into a hero, and those meant to be heroes can become villains themselves. It twists the folklore of the gargoyles often seen in prestigious buildings like Notre Dame and makes it into a gripping story of heaven, hell, and the in between. This book was middle-of-the-road for me. It had it's good points and it had it's bad points. There was nothing overtly hypnotic enough to draw me into a book binge, but it kept me reading. I liked that it was something new. No vampires. No werewolves. Gargoyles. Hasn't been done before; at least not in the books I have read. Extra points for originality. I also enjoyed the connection between Ingrid and Luc. The forbidden love aspect is always great to me, and nothing is more forbidden then an 18th century noblewoman and a damned gargoyle punished to live out life as a protector to beings they would sooner equate to insects. The romance was toxic yet all-consuming. I wanted more! I would recommend this to those who are tired of the monotony of vampires and werewolves and wish to branch out. Also, those who thoroughly enjoy historical fiction will find it most enjoyable I wager. More of my reviews can be found here at my blog: Take Me Away...I'm not a huge fan of historical fiction, but when I saw that this book featured gargoyles, I knew I didn't have a choice. I HAD to read this. I never expected to love it as much as I did though. Historical fiction is one of those genres that are hard to get right. You have to research the way everyone walked, talked, and acted as well as the world that you're trying to portray. It seems like there's so much more that goes into it besides just getting your story across. And Page Morgan did just that. She not only created an amazing story, but one that "Took me Away" all the way to Paris in 1899. For a time while I was reading this it rained and it completely finished out the setting. Dark, gloomy, and not knowing what to expect. It was so good. Even though the genre was so amazingly executed, that wasn't what kept me coming back to this book. It was the fresh, unique paranormal creature that had me hooked. If you know me, I DESPISE vampires and werewolves because they're "the norm" and I don't like reading about them anymore. They've just been over done. So when I heard this was about gargoyles, I desperately wanted to read this. (I had a WoW post for this and it appeared on a TTT post or two of mine.) That's just how excited I was about the fact that something new was coming to the scene. And the best part of all was the action. It was action packed and I simply devoured it. I believe I lost all ten nails at the end. I was so nervous! Morgan really knows how to draw a reader in! The action plus the descriptions she gave is enough to give anyone nightmares. (That horse and Bertrand scene definitely gave me some!) This book is the poster for paranormal reads. It has a great villain a unique paranormal creature, and a world filled with drama. This read is truly epic. The only thing I didn't like was the romantic tension in the book that actually blossomed in the end but between the wrong people! Ugh what I was looking for never amounted to anything! (Between Luc and Ingrid!) Gah I was so excited when they finally did that one thing, but then after that nothing else happened. I was definitely crushed. Hopefully in the rest of the series we'll get more of them. I am definitely a fan of them together! It's obvious I was a huge fan of this one. This debut by Morgan is a force to be reckoned with. The next book in the series is another one I cannot wait for. With this novel, Morgan has earned a spot in my favorite new to me authors.